Nashville, Tenn. (Monday, July 20, 2015) Eighteen-year-old reality television star and daughter of Willie and Korie Robertson, Sadie Robertson, shares her outlook on life as she opens up about herself and the values that make her who she is. Live Original represents everything that a well-adjusted teenager should be, even one who is growing up in the spotlight on A&E’s Duck Dynasty and performing on last year’s season of Dancing with the Stars. Dubbed as the antithesis of pop-culture stars like the Kardashians, Sadie was recently featured on Good Morning America after launching a YouTube video that went viral titled “just be you and live original” where she addressed fans make-up free and talked about the importance of being yourself. Sadie exhibits poise, respect for her family and friends, and a faith that influences her choices. Everyone wants to know how a family as eclectic as the Robertsons are raising such confident, fun, family-loving kids. With this book, Sadie sheds light on the values instilled by her family that make her the person she is. Live Original gives a simple list of principles that Sadie lives by, from her personal and spiritual growth to the relationships she has with her friends and family that allow her to flourish. These values include think happy, be happy; dream big; shake the hate; do something; and many more. Living as a culturally-relevant teen who loves God and her family, Sadie has become a role model for other teens and for parents who are eager to instill the same characteristics in their children. Sadie Robertson is well-known for her dimples and engaging smile, but there is more to the 18-year-old charmer and star of A&E’s Duck Dynasty than that. A high school athlete and motivational speaker, Sadie spends her summers on mission trips and working at a Christian youth camp spreading her message to peers about being confident in who you are and learning to “live original.” Sadie also embodies the creative and entrepreneurial spirit of the Robertson family and has carried her philosophy into multiple business ventures, collaborating with fashion designer Sherri Hill on her own “daddy-approved” prom dress line, Live Original, (she even walked in Hill’s show for New York Fashion Week in 2013) and developing her own Live Original line of school supplies for DaySpring. 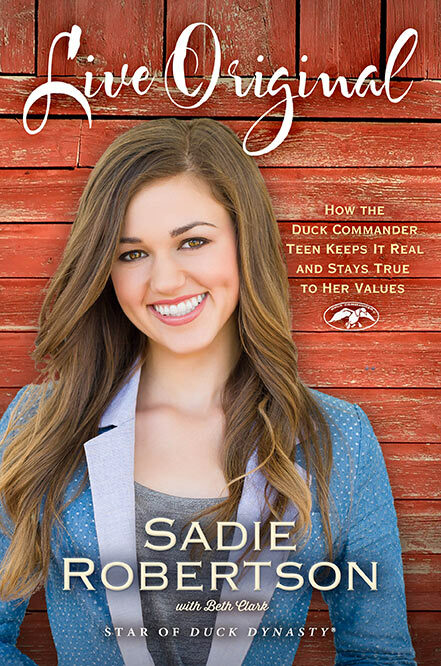 Sadie’s new book, Live Original: How the Duck Commander Teen Keeps It Real and Stays True to Her Values, is available now at retailers nationwide.